Wages in Chengdu are significantly lower than in cities in eastern China. Although data show that the pay gap is narrowing, with China’s economy slowing it looks as though employers in the city will continue to struggle to attract talent away from higher paying jobs near the coast. Three quarters of local employers who responded to a recent survey by FT Confidential Research (FTCR), a research company owned by the FT, described finding qualified staff as challenging, while 6.4 per cent said it was impossible. The survey of 69 Chengdu companies showed the vast majority believed they were paying less than their coastal counterparts and about a third said they were paying at least 30 per cent less for skilled workers than companies in similar industries in eastern China. Their perceptions are borne out by government data that show average private sector wages were 16 per cent lower in 2015 in western China, including Chengdu, than in eastern China. The data show the west is catching up, with pay rates growing by an average of 13.9 per cent a year between 2009 and 2015, compared with 12.6 per cent in eastern regions. But at these rates of change, it will take years for the west to match. The pay gap can be a challenge for Chengdu employers when competing with more developed eastern areas for skilled workers. Chengdu-based programmers were paid an average Rmb76,876 ($11,500) last year, around half of what a programmer would be paid in Beijing, according to local government data. Yan Jun took a 20 per cent pay cut when he moved from Shenzhen to head up a team of programmers at a Chengdu mobile gaming firm. Mr Yan says his company pays developers Rmb6,000 a month on average, compared with around Rmb9,000 in Shenzhen. “Salaries here aren’t competitive at all,” says Mr Yan. Instead of trying to poach from his former company, he is recruiting from local vocational schools, scooping up cheap but inexperienced computer science graduates. Wu Jin, a 32-year-old furniture maker in Guangdong province, is wondering whether to return home to Chengdu. On the one hand, his son will get a better education — his Chengdu hukou, the household registration system that determines access to services, means only second-rate schools are open to him in Guangdong — and his parents will be nearby. But the return home comes with a 20 per cent pay cut. “I am young, energetic and experienced but Chengdu firms won’t offer me a higher salary,” he says. Some employers are increasing wages to Shanghai levels to lure talent. At Envee In-Flight Entertainment, a WiFi service provider, programmers make on average more than Rmb10,000 a month, which is roughly the same as in Shanghai. The tech company recently offered a researcher with General Electric in Shanghai Rmb360,000 a year plus stock options to convince the candidate to make the move west. 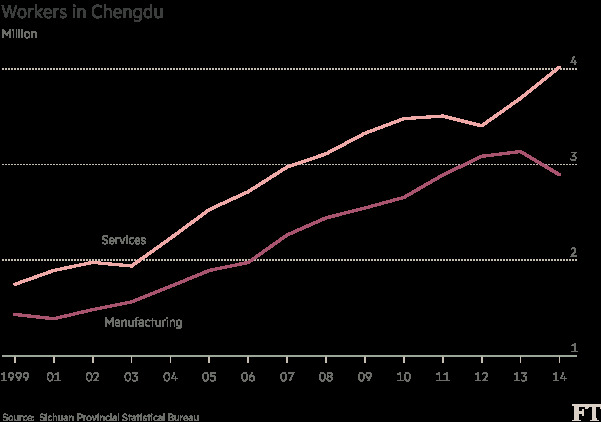 However, such actions remain rare: Chengdu’s wage gap is set to continue because of slowing economic growth. A monthly nationwide survey of Chinese labour market conditions conducted by FTCR found monthly wages in western China, including Chengdu, grew by just 3.5 per cent in the year to June compared with 13.1 per cent the year before. In eastern China, they grew 2.2 per cent against 14.1 per cent the previous year. For all of Chengdu’s apparent dynamism, investment in fixed assets such as infrastructure and property is the main driver of its local economy and slowing activity is dragging on growth. Investment in fixed assets in Chengdu grew just 5.8 per cent last year, against 10 per cent nationally. A third of Chengdu labour exchanges surveyed by FTCR said wages in the construction industry — the key beneficiary of government-directed investment activity — have risen particularly slowly this year. while Zhaopin, one of China’s largest jobs websites, reported a 30 per cent increase in openings in Chengdu during the same period, against a 5 per cent decline across western China as a whole. Jobs in the services sector can mean lower pay. But the service sector is helping to replace the manufacturing jobs being lost . The number of manufacturing workers in Chengdu fell 7.7 per cent in 2014 from 3.13m to 2.89m, the first drop in 12 years, according to the local statistics bureau, while the number employed in services increased by 8.8 per cent.